Slim Bomb Review - Does Slim Bomb Fat Burner Really Work? 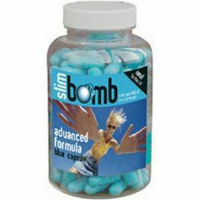 Slim Bomb is a nonprescription diet pill that is by no means new to the industry. It is made by a manufacturer called Slimming Solutions and it has been sold for about a decade. The company refers to this product as an herbal product, as it brings together a combination of various natural ingredients. Among the main ingredients within this formula are green tea leaf extract, caffeine, and Cha de Bugre. Based on this, it is clear that this is a stimulant based pill. Though this can be a positive feature as it can help a dieter to increase his or her energy levels, which makes it easier to exercise and to stay motivated throughout the length of the diet. However, this is all dependent on how strong the stimulants are in the product and on the individual dieter’s tolerance to this type of substance. While some people thrive with this effect, others find themselves experiencing side effects such as jitters and shakiness, anxiety and nervousness, headache, nausea, insomnia, or a number of others. The green tea within Slim Bomb may help to give some additional metabolic enhancement if it has been used in adequate quantities. As the amounts of the ingredients have not been shared on the official website, it isn’t possible to know whether the quantity of green tea in this product matches the amount used in studies that have found it to be helpful with weight loss. The Cha de Bugre in this formula isn’t an odd substance to be seen in a nonprescription weight loss pill. It is common enough in this kind of product. However, while it is known for a range of potential health benefits, it also has insufficient evidence to support claims about its effectiveness in losing weight. Most products that use this ingredient claim that it is an appetite suppressant. The promises made by the manufacturer of this product are that it will act as a metabolism booster and a fat binder. It is clear that the caffeine and green tea can possibly boost the metabolism – though whether or not there is enough to produce a measurable difference cannot be determined without quantities. What is confusing is the claim that it is a fat binder as none of its ingredients are linked with that benefit. As there is a risk of side effects and it is unlikely that the product will be able to live up to the promises made about it, it would be difficult to recommend Slim Bomb. This entry was posted in Non-Prescription Diet Pills Reviews and tagged caffeine, cha de bugre, green tea extract, herbal supplements on March 6, 2014 by Diet-Pills.cc.